Super excited to take the girls to the theatre, it's definitely something we don't do enough. It's a lovely family and friends morning out and a great cultural experience, but mostly it's fun! This month, on November 17th, as part of the UK/UAE 2017 Year of Creative Collaboration led by the British Council, Art For All is delighted to announce that they will be bringing Roald Dahl smash hit stage show George’s Marvellous Medicine to the UAE. 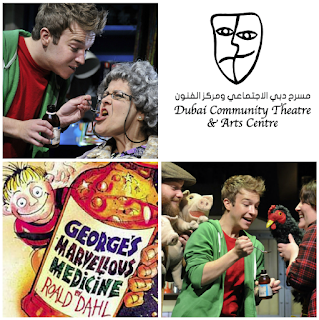 Performed by the Birmingham Stage Company and adapted for the stage by award-winning children’s theatre director, David Wood, this acclaimed production has already proved a sell-out in the four previous times it has been performed in the UAE. Luella definitely enjoyed the book and look forward to see the live show. I am sure most children kind of know the story of George! The hero George; a little boy who lives on a farm with his mum and dad, and horrible grumpy grandma – who is rather strange and tells him she’s a witch. One day, while left in charge of grandma, George decides he’s had enough of her bullying ways, and he’s going to teach her a lesson. Instead of giving her a dose of her normal medicine, he sets about making one of his own - with extraordinary results… An absolutely brilliant tale that stays true to Dahl’s wonderfully imaginative story. The reviews have been great! Complimenting the amazing sets and actors, saying audiences are in for a huge treat. This interactive show brings Dahl’s magical story to life for children and adults of all ages. It’s a must-see event. So, we look forward to see you there! What I got on Mumzworld.com this month! Yummy Mummy Sunday at Studio 91 - treat yourself!